Artist DWITT has painted a mural at The Howe Daily Kitchen & Bar for the LoLa Art Crawl. 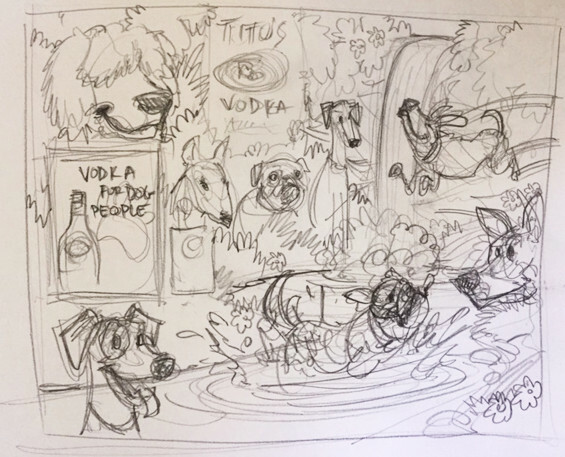 The Howe Daily Kitchen & Bar teamed up with Tito’s Handmade Vodka (#VodkaForDogPeople) and Artist David Witt to bring to life a mural based on a love of dogs and community. The Howe’s PAWtios are not just dog-friendly in that you can dine with your dog, you can order them something from their three-course dog menu. David Witt (aka DWITT) is a prolific illustrator whose artwork appears on posters, beer cans & bottles, comic books, T-shirts, art prints, & album covers. His work can be seen all over the Twin Cities and beyond for The Growler, Beer Dabbler, Zombie Pub Crawl, and for many other events and groups. Witt has painted murals at other Minnesota locations, including another dog mural at Stanley’s Northeast Bar Room in Minneapolis. Witt’s mural features the canine community in celebration of The Howe’s dog patio. For our Longfellow location the artist envisioned a panorama of dogs enjoying Minnehaha Falls! From his sketch pictured above to the actual mural shown below, it’s a doggone delight. Visit The Howe Daily Kitchen & Bar during the LoLa Art Crawl to view DWITT’s dog patio mural, and do bring your furry friends along. All artwork depicted is subject to copyright protection. Reproduction of shown work except for promotional opportunities is prohibited without explicit permission from the artist.